The current global practice of production, over-consumption and disposal of plastic products has birthed countless never-ending environmental, social-economic, climatic and well-being problems within our societies. Poor end-of-life management and governance of billions upon billions of disposed plastic products has led to plastic waste filling our lands, oceans, lakes and rivers, as well as the stomachs of an estimated 600 species of animals around the world. Sustainability in our plastic consumption cannot be achieved without altering the current systems of plastic governance, consumption and management. While acknowledging the importance of this ubiquitous material in our daily life, there are calls for modifications to our relationship with plastic. Sime Darby Plantations’ Chief Sustainability Officer, Dr. Simon Lord, highlighted the need to re-evaluate how we manage plastic disposal in the face of increasing demand for more land for agriculture and infrastructure. “Plastic is a generational issue. We are leaving a legacy for millennials, the children that we are educating, that is potentially a world that is not fit for them to live in and meet their future requirements,” said Lord, putting the onus on the shoulders of the current generation. He said this at the recent ‘Reimagining Southeast Asia 2018’ forum organised by The ASEAN Post. 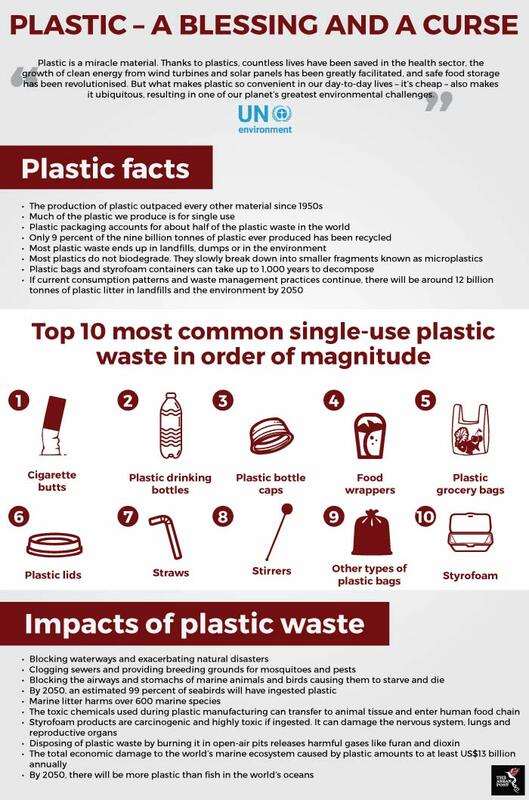 The Southeast Asian region dominated the global list of countries ranked by mass of mismanaged plastic waste or waste that is either littered or inadequately disposed in dumps or open landfills. The five countries, namely Indonesia, the Philippines, Vietnam, Thailand and Malaysia, collectively contribute 8.9 million metric tons of mismanaged plastic waste annually. According to global statistics, ASEAN countries contribute 60 percent of marine debris. At a national level, regional plastic waste management requires a spectrum of solutions, with focus on infrastructure for sufficient and proper collection and disposal in markets where this has yet to be provided, tied together to good policies. The World Economic Forum’s (WEF) Head of Circular Economy Initiative Antonia Gawel, said that while national governments need to set the tone for their countries’ ambitions, a lack of data on material flow in this space is a big challenge. Gawel explained that for better plastic waste management, the Global Plastic Action Partnership (GPAP) currently hosted by the WEF is identifying gaps in available data, as well as looking at systems that are needed to be put in place across different countries to improve data collection. Gawel puts forth a need for a systematic approach to govern plastic waste similar to the governance of climate change action under the United Nations Framework Convention on Climate Change (UNFCCC). “We now have a systematic approach for governments to report on emission, energy, and quite a lot of indicators through the UNFCCC. What we need to do is to improve our systematic indicator set in this sector, across many countries. The ideal outcome would be a possible partnership and a system in place to improve data collection and reporting. “Do we need a global plastics convention? It can have benefits in terms of setting a common framework for reporting and requiring governments to create plans and report against plans. At the same time, what we also know is that we really need leadership at the national level to drive implementation in real time. We are also seeing quite a lot of regional collaboration,” said Gawel, stressing the need to learn from other existing conventions. Currently, international monitoring on plastic is limited to imported and exported plastic waste that is regulated under the Basel Convention on the Control of Transboundary Movements of Hazardous Wastes and their Disposal. The Basel Convention focusses on hazardous waste and only concerns plastic waste that crosses national borders. Its primary objective is to end the practice of toxic colonialisation or dumping of industrial and hazardous wastes in territories of developing countries and countries with economies in transition by more developed ones. The UNFCCC is a framework for international cooperation to combat climate change by limiting average global temperature increases and the resulting climate change. Under the UNFCCC, signatories are required to submit national communications to report on actions and tracking of progress towards emissions reduction targets and existing gaps in climate change mitigation, adaptation and financing. The magnitude of the plastic waste problem is only going to increase with the continuous demand for this highly malleable material. Collaboration at national, regional and international levels need to be well coordinated to bring about effective and long-lasting change.